The Central Bank of Kenya has launched (11th December) a new series of circulation coins that updates both the designs and brings the coins in line with a 2010 constitutional provision which legislated the removal of presidential and political portraits from all future circulation type coins and banknotes. 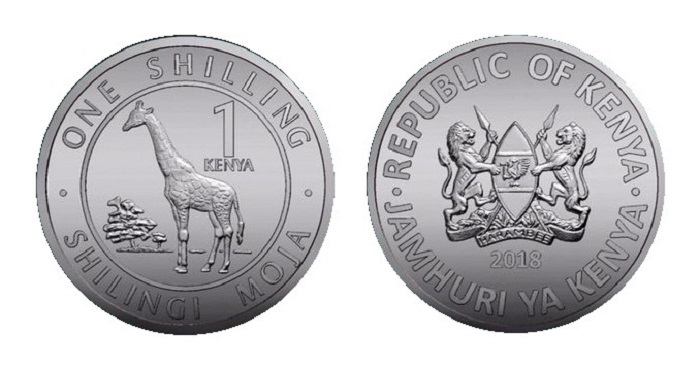 As part of the preparation for deciding on new designs, the Central Bank of Kenya invited the public to provide their views on the elements that they wished to see depicted on the coins. Having considered all submissions, the Central Bank considered the most appropriate elements including the designs that best meet the bank’s and cash handler’s technical requirements, in addition to serving the public’s aspirations. The president of the Republic of Kenya, Mr. Uhuru Kenyatta, who made his first visit to the Central Bank since taking office in 2013, presided over the introduction of the coins to the nation. The Central Bank presented a video of the new coins to the assembled audience of invited guests and the media, thereafter, the governor of the Central Bank, Dr. Patrick Ngugi Njoroge, presented a specially struck set of the four new coins to the president and commented that the coins new designs bear significant aspects of the country and will serve as a means of passing knowledge, conserving culture, and promoting Kenya’s global uniqueness. One-shilling coin (seen above): Image of a giraffe, nickel-plated steel. Five-shilling coin: Image of a rhino. Bi-metallic, golden-coloured centre and silver-coloured outer ring. 10-shilling coin: Image of a lion. Bi-metallic, silver-coloured centre and golden-coloured outer ring. 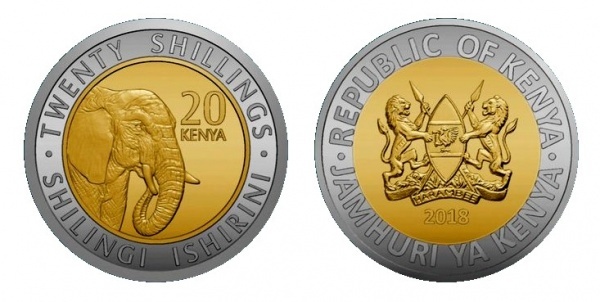 20-shilling coin: Image of an elephant. Bi-metallic, golden-coloured centre and silver-coloured outer ring. 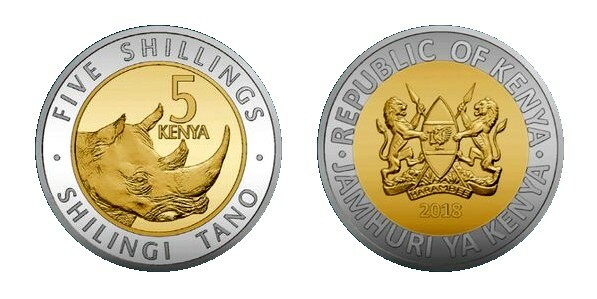 Each coin also includes a dual denomination of the unit of KENYA shown on the obverse. The coin’s denomination is included with wording in English shown above the primary design and in Swahili placed below. 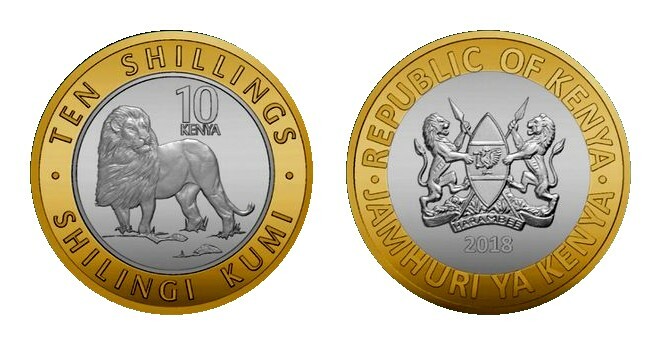 The reverse includes a depiction of the country’s national crest along with the text REPUBLIC OF KENYA placed above it with JAMHURI YA KENYA shown below. The new coins, which are officially issued on the 11th December, continue to include tactile features enabling visually impaired persons to identify the them. The market regulator of the Central Bank will, in the coming days, promote a campaign to create awareness and educate the public about the new coinage. The issue of the new coins conforms to the country’s new regulation on the issue of national currency without images of political figures. A series of banknotes has been proposed without political figures depicted and is expected to be unveiled by the Central Bank of Kenya in due course. For additional information about these coins and others issued by the Central Bank of Kenya, please visit their website.